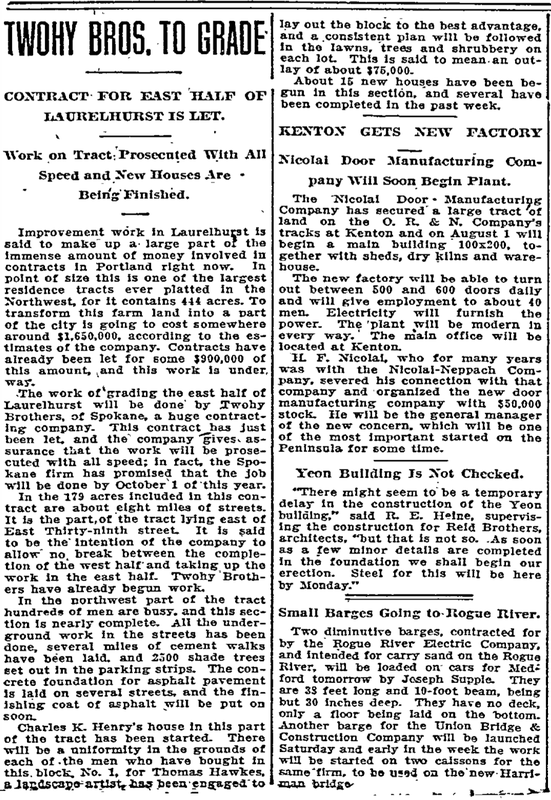 One of the large tasks now underway in the remaking of Portland is the development work which is being carried out in Laurelhurst, the addition which was placed on the market at the first of this year, and which for many years has been known to Portland and Portlanders as the Ladd Hazel Fern Farm. The immensity of the undertaking can only be realized by a comparison of the conditions as they now exist with those of a few months ago. All over the tract, the workmen have been engaged for several months in carrying out the plan of development, and it is but now that the results are beginning to be especially noticeable. Where, not many months ago, there was a wide expanse of land undisturbed by urban advances and was used solely for agricultural purposes, there is now evidence of development. 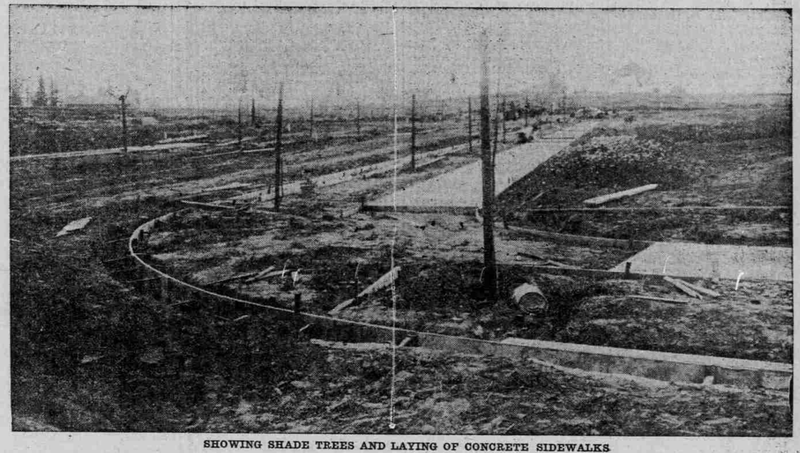 The earth is scarred by the giant steam shovels, which are grading the streets; on every side ditches have been dug for the laying of the water, sewer and gas mains, and now the asphalt workers are beginning to hard-surface the streets which have already been equipped with cement sidewalks and cement curbing. There are 26 miles of these streets, and there are over 200 men and dozens of teams at work in putting these streets into condition. A few months ago these streets were shown only by grade stakes and here and there a place where the graders had started at work. Now the entire scene is changed. The first quarter of the tract is practically ready for the hard-surface workers. The ditches have all been dug and the various mains laid, the sidewalks have been put in and the streets graded. All that remains to be put in is the final coating of crushed rock, tar and asphalt. This same work is now going on in the second and third plats of Laurelhurst. It is estimated that the first plat will be completed by Fall, and that next year will see the completion of the development work in the entire addition. One of the best features in this work is that the development work once done will stay done for some time. This is because the mains are connected with each lot line in the addition, so there will be no tearing up of streets in the future. are now preparing to erect their homes. The development has now advanced to such a stage that by the time the house started now are finished, all the improvements will be completed, and officials of the company report that within the next 60 days there will be scores of costly homes started in the big addition. The addition, with ample car services from three lines, high building restrictions and the finest possible improvements, represents the largest single development operation ever undertaken in the West. Less than a year ago, this probably was purchased for about $1,500,000. Now a sum equally great, or greater, is being expended in making the property desirable as a high-grade residence section, and the result has been enormous sales. In the first, second and third plats the great majority of the lots have been sold, and now the sales are beginning to assume large parts in the fourth and last plat, which was placed on the market only a few weeks ago. On one block, five handsome homes are to be erected this summer. One of these, one for Charles K. Henry, has already been started on the crest of the entire addition, adjoining the site of the old Ladd Farmhouse. This home will cost $30,000. Other handsome homes have already been completed, and now there are a number of lots being excavated for pretty residences, while in many of the architects' offices, plans are being prepared for houses to be built this Summer. Improvement work in Laurelhurst is said to make up a large part of the immense amount of money involved in contracts In Portland right now. In point of size this is one of the largest residence tracts ever platted in the Northwest, for it contains 444 acres. To transform this farm land into a part of the city is going to cost somewhere around $1,650,000, according to the estimates or the company. Contracts have already been let for some $900,000 of this amount, and this work is underway. The work of grading the east half of Laurelhurst will be done by Twohy Brothers of Spokane, a huge contracting company. This contract has just been let, and the company gives assurance that the work will be prosecuted with all speed; in fact, the Spokane firm has promised that the job will be done by October 1 of this year. In the 179 acres included in this contract are about eight miles of streets. 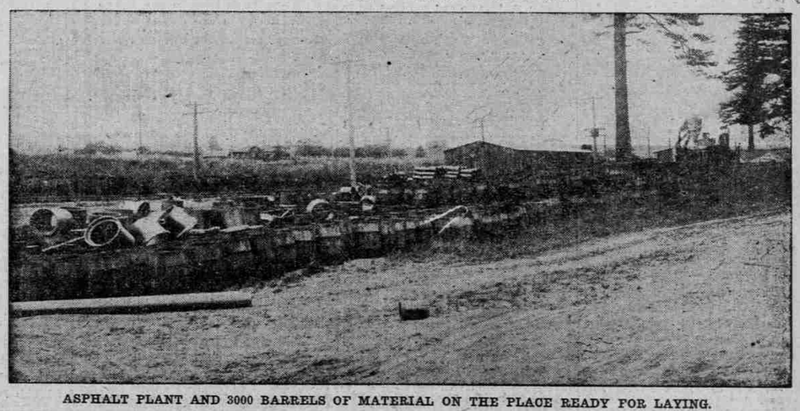 It is the part of the tract lying east of East 39th street. It is said to be the intention of the company to allow no break between the completion of the west half and taking up the work in the east half. Twohy Brothers have already begun work. In the northwest part of the tract hundreds of men are busy, and this section is nearly complete. All the underground work in the streets has been done, several miles of cement walks have been laid, and 2500 shade trees set out in the parking strips. The concrete foundation for asphalt pavement is laid on several streets, and the finishing coat of asphalt will be put on soon. Charles K. Henry's house in this part of the tract has been started. There will be a uniformity in the grounds of each of the men who have bought in this block, No. 1, for Thomas Hawkes, a landscape artist has been engaged to lay out the block to the best advantage, and a consistent plan will be followed in the lawns, trees and shrubbery on each lot. This is said to mean an outlay of about $75,000. 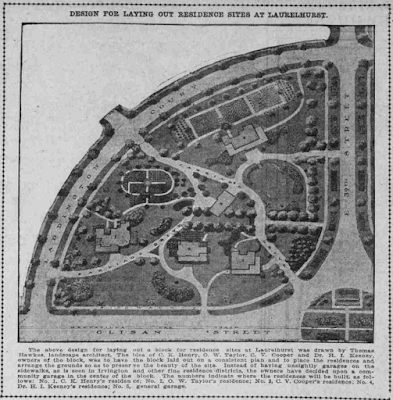 The above design for laying out a block for residence sites at Laurelhurst was drawn by Thomas Hawkes, landscape architect. The idea of Charles K. Henry, O.W. 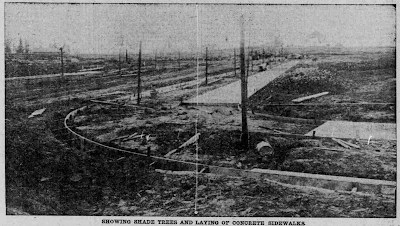 Taylor, Charles V. Cooper and Dr. Homer I. Keeney, owners of the block, was to have the block laid out on a consistent plan and to place the residences and arrange grounds so as to preserve the beauty of the site. Instead of having unsightly garages on the sidewalks, as seen in Irvington and other fine residence districts, the owners have decided upon a community garage in the center of the block. The numbers indicate where the residences will be built, as follows: No. 1, C.K. Henry’s residence; No. 2, O.W. Taylor’s residence; No. 3, C.V. Cooper’s residence; No. 4, Dr. H.I. Keeney’s residence; No. 5, general garage. from Oregonian, 10 Jul 1910. About 15 new houses have been begun in this section, and several have been completed in the past week. Out in Laurelhurst there is a machine at work, drawn by 15 horses that grades the streets, carries the dirt on a chain arrangement and loads a wagon in two minutes. This is part of the outfit that Twohy Brothers, the railroad contractors, have at work in the north half of the tract. Charles K. Henry says that about $1,600,000 worth of improvement work is being done now in Laurelhurst, and that it is being carried on with all the speed possible. In the northwest quarter of the tract sewers, gas mains and water mains have been laid, and service pipes carried to the curb line of each lot. Three trenches had to be dug in each street for these utilities pipes, owing to the present ordinances. In this section concrete sidewalks are being put down on each street and eight miles of asphalt paving will have been laid by the ? ?r Asphalt Company by November 1, according to their contract. Altogether, in Laurelhurst, 26 miles of asphalt will be hid in the winding streets, which is expected to be a valuable asset in attracting automobiles thither, especially when tourists desire to see the city. Twohy Brothers have steam shovels at work in the north half grading for the streets, while in the southwest quarter, where 31 acres will be comprised in Ladd Pa, Archie Mason has a big grading contract. Laurelhurst was platted October 9, 1909, and since then just about 60% of the lots have been sold, says Mr. Henry. Sales are keeping up well, too, he declares. The remarkable speed with which Laurelhurst is being transformed into a fine residence district has had a stimulating effect on the surroundings. The promoters are contributing largely to the present prosperity of the East Side and especially to the territory that is tributary to the Burnside Bridge. At present the entire addition is torn up by the Improvement operations in progress. 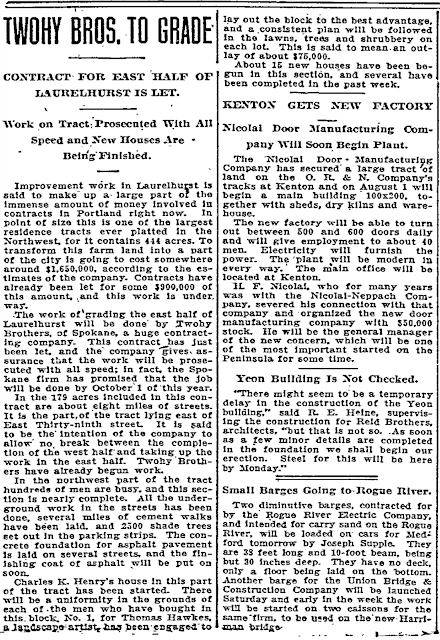 Among the recent homes projected is that of Dr. Homer I. Keeney, which will stand near the residence of Charles K. Henry. Dr. Keeney's home is to be on the style of a California bungalow, with unusually wide porches on the east and south sides, and a large porte cochere on the north. The living room will be 20x30 feet in size, finished in ivory enamel with a rock-faced cut sandstone fireplace of unique design. For the dining room the size will be 16x18 feet, and the finish mahogany with a decorated frieze encircling the walls. One of the attractive features of the dining room will be a large built-in buffet with leaded glass doors and a large French plate-glass mirror. In other respects, the finish of the dwelling will correspond. Exterior walls of the first story will be of red pressed brick, the remainder to be covered with shingles stained a French gray. Work on the basement has already been completed. The cost of this residence will be $8000. The plans were drawn by the Spencer McCain Company. The plasterers are at work in Mr. Henry‘s home, which will be one of the costliest in the addition. He's sparing no trouble nor expense In getting a home after his own heart, and many features will add to the comfort and attractiveness. Mahogany will be the wood used downstairs for finishing.